“Pesth-Ofen. 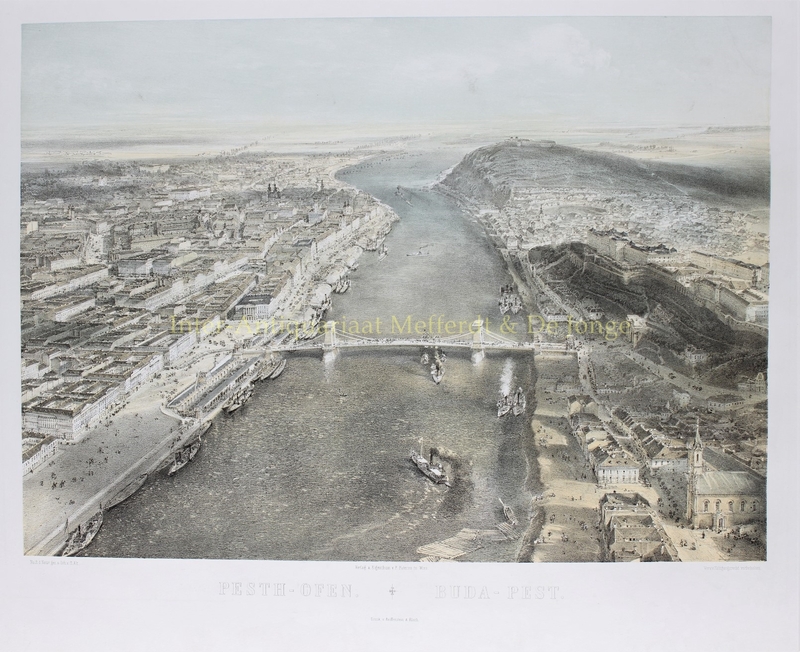 / Budapest.” lithograph in colour made by Rudolf von Alt, approx. 1855. Printed in Vienna by Reiffenstein & Rösch. Size: (view) 41,5 x 57,5 cm, (incl. text) 46,5 x 57,5 cm. Across the Danube we see the Széchenyi Chain Bridge (Széchenyi lánchíd), at the time one of the largest bridges in the world, that had connected Pest and Buda after the Hungarian Revolution in 1849. The Kossuth Lajos tér where great public buildings were erected in the second half of the 19th century, is still called Töm? tér (“Landfill Square”), a low-lying territory flanking the river, filled with rubbish to raise the level of the ground. It is the time just before the Austro-Hungarian Empire. A time in which traditional aristocracy gradually faced increasingly wealthy men of the cities, who like elsewhere in Europe achieved wealth through trade and industrialization. Newly prosperous members of the bourgeoisie erected large homes, and began to take prominent roles in urban life. Infrastructure, such as railroads, in aid of industrialization, transportation and communications was developed everywhere. The important view painter Rudolf von Alt (1812-1905) was famous, well beyond the frontiers of Austria, for his ruin landscapes, his city views and his interiors and for his bold and contrasting colours. Von Alt knew constantly how to bring something new to his work. His very clear and lightened style, without insipidness or cheesiness, evolves into an almost visionary sense of the atmospheric reality. As it was “Nach d[er] Natur gez[eichnet]” [drawn after nature], this magnificent view of Budapest must have been made after Von Alt flew over the city in a balloon.